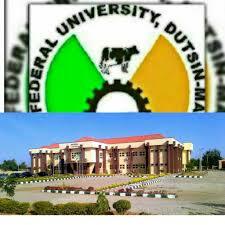 “I read a fake news by Sahara Reporters that Federal University Dutsinma was close due to A brewing tension between minority Christians and a larger body of Muslim students has resulted in the closure of the Federal University in Dutsin-ma in Katsina State by the university’s management. This is not true, what happened actually was on Friday, the suspended Vice Chancellor, Prof. Haruna Kaita, forced himself to office after securing a court order. He came with thugs and strange faces to the University and the students stage a protest chanting, “Bamayi”. Professor Kaita along with a convoy of strange people believed to be hired thugs forced their way into the campus with the sole purpose of returning him (Kaita) to his seat. His entry was received by protests from students who confronted the convoy and barricaded the Senate building in order to prevent him from gaining entry. But in a show of force, Professor Kaita and his thugs initially overpowered the students, broke keys and door locks and eventually made his way into the Vice Chancellor’s Office. Before this point, the Ag Vice Chancellor, Professor Armayau Bichi and his Registrar had been advised to leave their offices for safe location in order to prevent potential bloody clash. The students later regrouped and in greater number moved into the area and succeeded in chasing Professor Kaita and his men out of the campus. The fear of the uncertainty that may happen on Monday, the Acting Vice Chancellor, Prof. Armayau Bichi called for urgent Senate meeting and decision was taken to close down the University to prevent crisis between suspended Vice Chancellor and Students”.